The Longstreet Cemetery is a small one, tucked amid the tall pines of north-west Montgomery County. This place is devoid of sound except for that of birds, wind and the occasional pickup. But there is music in the ground, if you know where to look. 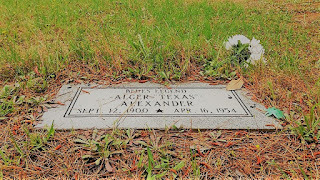 Buried in one of the grave-yard's back rows is Alger "Texas" Alexander, whose soulful moans, shouts and hollers after years working in cot-ton fields and on the railroad made him a father of the Texas blues. Few will recognize the name, for this was a man whose death 62 years ago this month went unreported by the local newspaper. He died penniless despite a rich musical legacy that influenced bluesmen like Lightnin' Hopkins and Lowell Fulson. In an effort to make up for the neglect of the past, the Montgomery County Historical Commission plans to honor Alexander with a historical marker at the African-American cemetery. It would be only the second site with the designation in the fast-growing county. Last year the commission awarded one to a Conroe barber shop that has operated for nearly a century. "He is a little-known but very important figure in the development of the Texas blues," Larry Foerster, chairman of the historical commission, told the Houston Chronicle. "There are many other blues artists, like Hopkins, who get all the attention. But Texas Alexander was really the one these blues artists emulated." Alexander was born in Leon County in 1900 and raised in Richards. He learned how to sing the blues from other blacks while working in the fields and began to perform at picnics and other events. He could not play the guitar but carried one with him to loan to others. With the increasing popularity of the blues in the Roaring '20s, Alexander made his first recording sessions in New York for the Okeh Records label. In all, he recorded more than 60 songs from 1927 to 1934. When Alexander sang the blues, he bellowed. He often skipped a beat, and his timing was tough for a band to follow. But it didn't stop some of the era's top musicians from playing with him. "He was an amazing guy who hollered field-type blues," said music scholar Chris Strachwitz, whose Arhoolie record label is devoted to American roots music. "He had a good, strong voice." Coy Prather, an Austin-based music writer, said Alexander's career was held back by his inability to play an instrument, "but his songwriting was a step above." Among Alexander's songs was "The Risin' Sun," which some music historians believe later evolved into the folk-rock ballad "The House of the Rising Sun," a chart-topping hit for the British group the Animals. Alexander also wrote "Frost Texas Tornado Blues," which told of the tornado that tore through the town in 1930, killing 41 people. 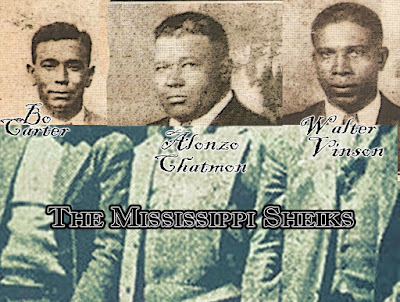 He recorded the song with the Mississippi Sheiks in 1934. After the recording, he re-turned to Texas to play neighborhood dives and juke joints. And then, he disappeared. "Some say he spent five years until 1945 in prison for murdering his wife. But Prather said he couldn't find any record of Alexander being arrested or serving jail time in the Texas counties where he lived."